Start with the command ./tileminator . Compile with the command ./make . 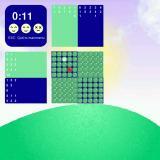 Tileminator is a Picross- Nonogramm-, Paint-by-Numbers-similar game. Your goal is to reveal all correct tiles of a grid. To find out the correct tiles, there aer numbers over and next to the grid. So you know the size of the blocks but not their exact position. This can be found out by combining the numbers. In contrast to other games like that the solved puzzle doesn't form a picture. But the tiles are arranged randomly. On main menu you can see the best times, which were achived so far. You can also choose there difficuly and size of a riddle. Ingame left mouse button activates a tile, right mouse button de-/marks a tile.